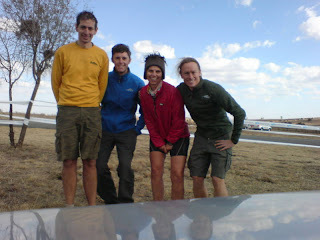 When my adventure-buddy Gerard forwarded the Baron's email about the adventure race in KZN, I knew I was in trouble. It was about a month aftere Ride2Rhodes, and I haven't done much since. But I also don't know how to say no. I've had some adventures with Pablo and Gerard and they're about the best people to go with on any adventure ... strong, lots of endurance, lots of patience, they both know how to navigate, they never get tired, and an excellent sense of humor - both of them. Gerard found the fourth team mate, a really good mountainbiker and, so i heard, an even better runner. So Yoshimi was going to battle the pink robots again. This race was going to be different: we would be our own support crew, with one team member driving the car while the others were racing - the driver would have his own set of control points to collect before meeting the team and swapping being a second, for being a racer again. - force adventure racers to learn how to use technology! Yaaay! Registered teams had about a week to figure out how on earth to blog their progress on http://arkzn4.blogspot.com/ - most of us used the travel-time down to PMB to figure this out. At 6:00 on Saturday morning we received an sms telling us that we had to be at the Farmer's Market for the race briefing at 7. Aintree Lodge (where we camped) were very close to the start, so we had enough time to wander around the farmers market and breakfast on hot chocolate and huge vetkoek. We received the instructions, and then had to go find the start of the race. I was the second for the first leg - had to go find a shopping centre (car, boat on roof, bicycles on back, with trailer, through Pietermaritzburg without a map, first to the wrong centre, but DID manage to find the right one) to count the fish in the pond, and then drive to the first transition, get the bikes out, lube them, and wait for the team. They arrived in third place. We jumped on the bikes, and finally the race started for me as well. Some excellent navigation decisions by Gerard, some NICE downhills, quite a lot of climbing, and we arrived at the start of the paddle leg. only 2 members had to paddle, so I found myself seconding again ... we had to go take a picture of some or other waterfall somewhere, before driving to the next transition. Wellll and THAT'S the reason why I’m not a navigator on adventure races! I got totally lost, finally found the waterfall after a whole lot extra kilometers, and arrived at the transition about 15 minutes after the paddlers. We were still in third place, and while collecting pictures of controls, found Team Xtreme along the way. We teamed up with them and Gerard navigated us to the next transition point. It was about 30 kays, but mostly uphill, lots of Ride2Rhodes type riding often on non-existing or quickly-disappearing tracks, and it took us a very long time to get to the next transition. Team Xtreme had a quicker transition, but our guys chased them down on the hike, and both teams came in just before dark. The transition to biking took a while, and we left shortly after Team Xtreme. I knew that we wouldn't catch them, or drop them on an uphill, and Gerard was the better navigator, so they wouldn't drop us before we found all the checkpoints, nor would they allow us to get away from them. They were far stronger than our team at this stage, cos their girl was doing the seconding and the previous long cycle-leg took some energy out of me. Some excellent navigation decisions from our navigator, a nice downhill or 2 and we lost them. They caught us again on a long never-ending climb, but luckily for us there was another 9slightly gnarly) downhill and we finally could get rid of them. It was a toss-up between Gerard and myself about who was going to second the last leg, but I think I convinced him that I was more tired than he was, so I was the second again. It would have been an 8kay trail-run, but it was difficult to find the trails, and they decided to rather do a 21 kay road run. I loaded up the bikes, packed everything in, and then drove to the finish.... as i drove passed team Olympus (who also opted for the roadrun) it was -1° outside! I pitched the tents (in that weather!) and then waited for team Olympus. Team Yoshimi arrived in second place! - was hard, because of the extra tasks that the seconds had to perform - finding shopping malls in a foreign town! - the changing of seconds was also hard - you'd come in from a race, but the next leg you are the second, so although you're hungry and tired, you immediately have to start looking after the other team members to get them out of transition as quickly as possible.